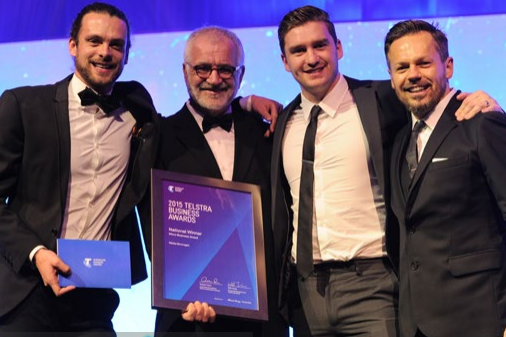 The 24th edition of the Telstra Australian Business Awards will undergo some changes to its established format this year with alterations of the Medium Business Award category and the introduction of a Charity Award for the first time ever. The Telstra Business Awards celebrate the achievements of small and medium businesses, considered to be the life blood of the Australian economy. In announcing the opening of nominations for this year’s edition, Telstra Business Awards Ambassador and Telstra Business Group Managing Director Will Irving encouraged Australians to recognise brilliant businesses by nominating them in one of the five categories. “The Awards recognise trail blazers who embody the innovative, entrepreneurial spirit of Australian business,” Mr Irving said. The five Award categories include New Business (formerly Start-Up), Micro Business, Charity, Small Business and Medium Business. As of this year, the number of employees in the Medium Business Award category will be increased from 200 to 500 to reflect the role that medium businesses play in driving the nation’s economic growth. “Medium businesses play a vital role in our economy, generating a disproportionately high percentage of Australia’s business revenue compared to their actual numbers. By increasing the number of employees in this category we hope to attract more talent and competition to the 2016 program,” Mr Irving said. The 2016 program also includes the introduction of the new Charity category. Mr Irving said the introduction of the new category reflects the significance of the charity sector as shown by the latest figures released by the Australian Charities and Not-for-profits Commission. According to their 2014 report, Australian charities have a combined annual income of more than $103 billion and employ more than 1 million people, giving significant contribution to Australian communities and the economy. Entries for the 2016 Awards can be submitted from 3 February until 23 March. For more detailed information on the Awards or to nominate a business, please visit: https://www.telstrabusinessawards.com/.